To heal wound on Right leg. Mrs. N. is an 89 year old female who struck her right anterior lateral leg on the corner of her car door. It did not break the skin on impact. Incident occurred on 2/6/2014. I first saw the patient on 3/6/2014. 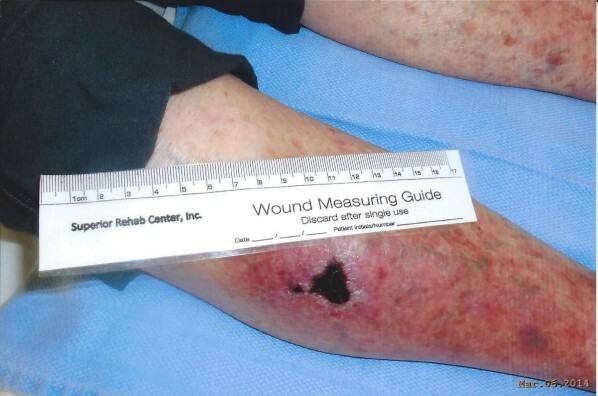 Wound measured 1.8 x 1.7 (see photo below). Tissue was dark red and grey. Patient said that there had been a bruised area for several days. It then developed into a hematoma. Patient saw her physician for 3 or 4 times and was told to use Neosporin, however, it continued to draining so she was referred to SRC. I debrided and decided to use the Anasept Gel. The Anasept spray is used prior and after debriding. I covered with a Primopore and asked to see patient twice weekly. 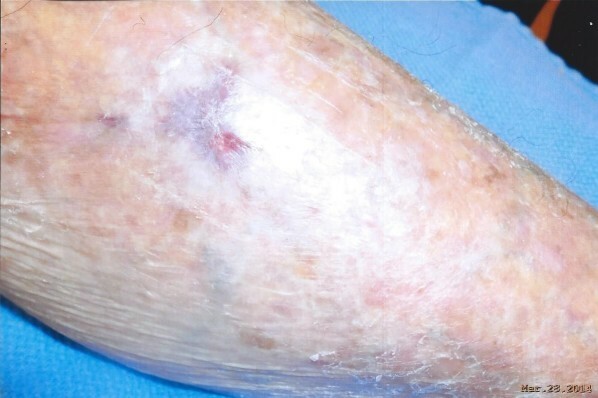 Patient continued to be seen twice weekly with debriding and Anasept Gel the protocol. Wound looked cleaner and smaller with each visit. On 3/20/2014 wound now measured 0.8x 0.3. I was extremely pleased with the quick results the patient was achieving. New photo was taken on 3/28/2014 and wound was closed and healed (see photo below). Patient was discharged and delighted. Dramatic results evident as the patient was seen only 7 times and wound was closed and healed. I attribute the use of the Anasept Gel as the reason for this. I am quite pleased and will continue the use of this product. 3/28/2014 wound was closed and healed.